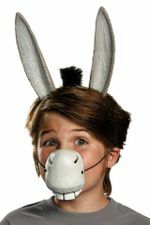 This child size donkey costume is great for Shrek Donkey, Eeyore, or Christmas pageant costumes! Includes a gray plush jumpsuit with attached tail and zip front, and hood with donkey snout and ears. By Smiffy's.